for Soil Testing - This cone is used to find out viscosity of bentonite slurry and similar material. The marsh cone is 6 inch in diameter at the top and 12 inch long, and tapers to join a tube 2 inch long and 3/16 inch inside dia. The capacity of the funnel is 1500cc. 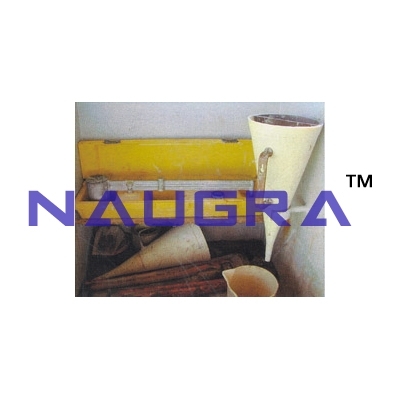 Time in seconds required to flow out 1000cc of slurry from cone is measured as funnel viscosity of the material..
We are leading manufacturers, suppliers & exporters of Marsh Cone For Testing Lab for Soil Testing Lab. Contact us to get high quality designed Marsh Cone For Testing Lab for Soil Testing Lab for schools, colleges, universities, research labs, laboratories and various industries. We accept bulk orders for government tenders in all countries around the globe.